AT THE HEIGHT of his footballing peak, George Manneh Weah was unstoppable. His most-famous goal for Serie A side AC Milan against Verona on September 8, 1996 is in the history books as one of the best goals ever scored by a modern-day striker. THE COAST-TO-COAST one-man show during the 1996-97 season, saw Weah showcase all of his attributes: speed, power and expert finishing, dispossessing the opposing team’s players and embarking on a 180-degree spin before slipping the ball at the back of the yawning net. THIS WAS VINTAGE Weah at his best, who brought so much pride and joy to Liberia. A year earlier in 1995, Weah made history by becoming the first African footballer to clinch the FIFA World Player of the Year award. Not even modern-day heroes Didier Drogba, Samuel Eto, Mohammed Sallah and others have come even close. ADDITIONALLY, Weah’s exploits landed him the European Footballer of the Year and thrice African Footballer of the Year in 1989, 1994 and 1995 respectively. FIFA HAS penned him down in the history books as “the precursor of the multi-functional strikers” of his time. In 2004, he was named by Brazilian legend Pele in the FIFA 100 list of the world’s greatest living players. WEAH’S FOOTBALLING exploits made him popular, so popular that a cross section of Liberians have entrusted him with the Presidency of Africa’s oldest republic. NO ONE CAN take away from Mr. Weah what he won as a footballer – and no one would dare to even try. TODAY, HOWEVER, Mr. Weah is on a different level. The cheering of the football field was replaced with the rugged political field in Liberia. Mr. Weah surpassed expectations in his second try for the presidency to lead a nation in the midst of an important political transition. WHILE MANY Liberians are hoping that President Weah succeeds, there are some critics who feel otherwise – and this is normal for any multiple democracy. No one leader can please each and every member of his country and there are bound to be detractors, critics – and many unsympathetic to the ruler or leader of the day. Labeling those critics and folks unsympathetic, does not give any leader or ruler the right to brand them as “Enemies of the State”. ON APRIL 12, 1980 when Master Sargeant Samuel Kanyon Doe seized power and ended decades of Americo-Liberian rule. Doe’s rise to power was greeted with chants of “Country Woman Born Soldier” and “Congau Woman Born Rogue” – a pilgrimage of sorts to what many perceived as a period of massive corruption, nepotism and broad-day stealing by the Americo-Liberian leadership which dominated rule in Liberia for more than a century. SINCE HIS ELECTION in January, President Weah once touted as a man of humility appears to find himself falling under the same spell of sycophantic cheers that leaders and rulers before him endured. His rants Sunday, upon his return from the United Nations General Assembly clearly put on display similarities of the early years of Samuel Doe. PRESIDENT WEAH not only rained a trail of verbal assaults on protesters who recently took to the streets to demand accountability, transparency over the recent reports of missing billions in local currency, he even questioned why those who turned out to welcome him home Sunday, did not counter the protesters last week. THE PRESIDENT WENT on to suggest that journalists who broke the story would be called in to answer questions about their revelations. SADLY, THE PRESIDENT is continuing a pattern of drawing comparison with his leadership style with that of his exploits on the football field. This was evident Sunday as he struggled to explain the options at his disposal. WELL SO FAR, Mr. President has made a number of mistakes because he and his advisors have selected to ignore the writings on the wall and the red flags from so-called critics and journalists. Two loans undertaken by the government have so far failed to materialize as the Legislature appears to have sidelined the bills from being signed into law despite both loans winning 4-G passages in both houses of the legislature. THE FIRST LOAN is from the makeshift Eton Financial Private Limited, for the pavement of the Buchanan to Cestos road; Cestos to Greenville road; Greenville to Barclayville road; and the Barclayville to Pleebo road. The project will also see the pavement of the Tubmanburg to Bopolu and the Medina to Robertsport road corridors. The second loan with EBOMAF Group owned by President Weah’s friend, Bonkoungou Mohamoudou, is eyeing 337-kilometer roads targeting the Kessely Boulevard to Sinkor Road and the Tappita to Zwedru road corridor, including the Toe Town to La Cote d’Ivoire and the Zwedru to Greenville road corridors. THE MEDIA and those the President view as critics have done nothing but try to assist the government to be more transparent and cautious in approaching deals to construct roads, particularly two loan deals for roads that have so far hit a brick wall. WE FIND IT TROUBLING that President Weah would continue to use football as a measuring stick for his current predicament, even going as far as to once again repeat a story that he has been unable to prove, regarding journalists who were against him during his footballing days. WHAT PRESIDENT Weah has failed to realize is that Liberians cannot and should not be expected to guess his worth. As President, transparency and accountability should be the hallmark of his leadership. The President cannot have his cake and eat it. He cannot in one breadth expect Liberians to guess his worth while refusing to be more transparent about his earnings; and how he is managing to undertake so many massive building infrastructures in less than a year in office, structures he did not undertake at the height of his footballing peak or during his tenure as a Senator. THE TRUTH of the matter is, Liberians did not go to the polls to elect an incompetent leader as the President appeared to suggest Sunday when he said: “When the competent is not available the non-competent becomes available,” while seeking the help of Liberians to make his government’s Pro-poor agenda a success. LIBERIANS, CONTRARY TO what President Weah is projecting, went to the polls and chose him because they wanted the best. Those who voted for him, did so because they wanted someone competent, someone capable of standing up against impunity, corruption, nepotism and greed. TODAY, banking institutions are rationing local and US currency to consumers, something each and every Liberian who go to the banks on a daily basis can feel and can see. Some Lebanese and Indian businesses are pondering closing shop due to intimidation and a rapidly declining economy. Those guarding President Weah from seeing the realities on the ground and keeping him in a bubble are doing him more him harm than good. LIBERIANS VOTED for change and for a competent leader. 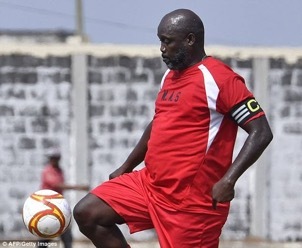 The tricks on the football field may have worked wonders for George Weah the footballer, but they will not, for Mr. George Weah, the President.